Removal of useless concrete from structures, buildings, road pavements etc. Waste concrete generated due to concrete cube and cylinder testing, destructive methods of testing of existing structures etc. 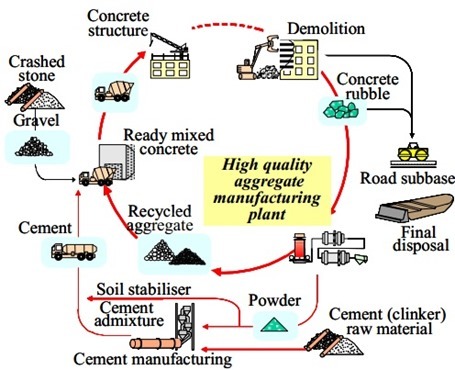 Usually demolished concrete were shipped to landfills for disposal, but due to greater environmental awareness, the concrete is being recycled for reuse in concrete works. There are a variety of benefits in recycling concrete rather than dumping it or burying it in a landfill. Keeping concrete debris out of landfills saves space there. Using recycled material as gravel reduces the need for gravel mining. There are also economic benefits. Recycled concrete is a construction material that the community does not need to pay for; those who generated the concrete waste pay a fee to have it recycled. The strength of recycled aggregate concrete is about 10 to 15 per cent less as compared to concrete with fresh aggregate. However suitable mix designs may be made and reliable results obtained. The mix requires slightly higher quantity of cement or using admixtures to reduce water requirement. Recycled aggregate concrete can be safely used as plain concrete. With proper corrections in mix design, it can be used for R.C.C. works also.